It’s a popular phrase used to describe people, things, and ideas that just don’t mix— »like oil and water. » Except it’s not entirely true. Oil and water can mix, and can be very difficult to completely separate when brought together. Think of environmental oil spills or wastewater treatment, and you quickly realize that separating out unwanted oil to restore water to a natural or pure state can be a monumental task. In a research paper published on March 22—the United Nations-designated World Water Day—engineers and physicists from Tufts describe how they devised a low-cost membrane capable of rapidly filtering oil from water and oil mixtures without the membrane getting fouled. The advance in material science could be a game changer in the battle against pollution. It’s well known that oil-contaminated water can have long-term harmful effects on wildlife and the environment. Current strategies to mitigate that harm include burning the oil in place or using mechanical devices, such as booms, skimmers, or absorbent material, to help clean up the mess. In practice these methods are expensive and not very effective, particularly for cleaning up large oil spills. The lotus leaf achieves its dual behavior with a combination of a waxy surface chemistry and a nanostructured texture on the surface. The textured surface traps air in tiny pockets, making it difficult for water to make contact with the leaf because of water’s high surface tension, forming droplets. Creating an oil-filtering membrane could utilize a similar combination of surface chemistry and texture to separate oil from water. 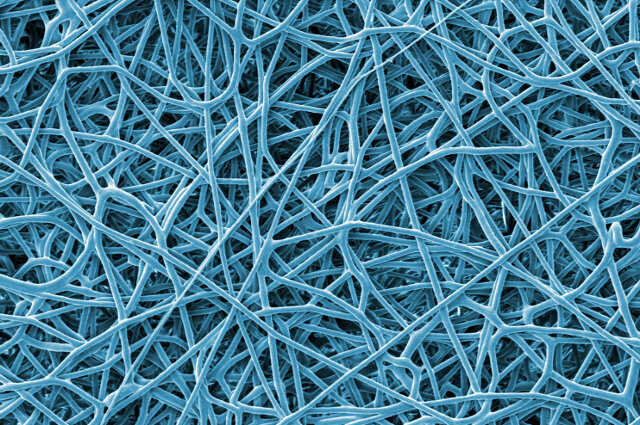 Joined by professor Peggy Cebe and graduate student Nelaka Govinna in the Tufts physics and astronomy department, the research team created a material that combined water-repelling chemistry and texture using a technique called electrospinning. Govinna, who fabricated the filtration membranes, explains electrospinning as a technique that creates an electrically charged liquid stream of polymer emerging from a very narrow needle. As it flows from the needle, the polymer dries as a fine thread and deposits randomly on the target surface, creating a non-woven, porous web of fibers. The polymer they used was a chemical chain surrounded by fluorine atoms, which give it water-repelling properties, while the random weave traps air like the lotus leaf to help minimize the penetration of water. By contrast, oily and organic substances flow over the fluoropolymer and through the membrane. In this case, the type of functional polymer provided the membranes with some ideal properties: oil and organic chemicals run rapidly through the membrane, up to seventeen times faster than the PVDF membrane without additive, while water is held back. The oil-removing PVDF-PFDMA membranes, which allow oil and organic solvents to pass through, don’t foul up like water-removing membranes tend to do, and could therefore be applied to long-term, industrial-scale applications. Using different additive polymers could tune the filter’s properties for different applications, from oil spill cleanups to water purification.